Get to know our members better by reading more about them! If you’re a member and would like your story included, contact Laura Ackerman. Click the team name to expand or collapse their story. How You Became Interested in AAI Work: I took an obedience class with a trainer who was offering a therapy dog class. I took the class and realized my dog had the potential to do this work. Your Partner’s Favorite Place to Visit: She enjoys reading with children because she can lay down and take a nap! 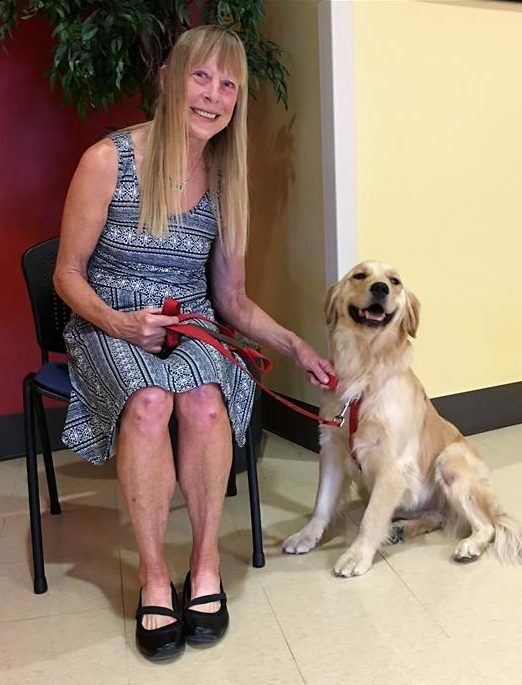 She also enjoys visiting with college students, especially the students at Rocky Vista University, who are always so kind to her (and me). Your Most Memorable Visit: One year on Christmas Addie and I visited a senior living facility. There were not as many people to visit as I expected, because most residents were busy with their families. As we walked through the assisted living floor, a family member asked if we would visit her 92-year-old mom, who told me how she was temporarily in assisted living while she recovered from a fall, and her daughter was caring for her dog temporarily. She missed her dog terribly and greatly enjoyed the visit with Addie, who settled at the woman’s feet while the woman stroked her. As I left, the daughter confided to me that her mom would never be able to live independently again and would never be able to have her dog live with her again, so this visit meant more to them than I realized. That really moved me, as I know how I would feel if I had to give up my pets. That one visit made the whole day worthwhile. How Your Partner Unwinds After a Day of Work: We go for a walk and then she takes a nap. Napping is high on her list of priorities. What You’ve Learned from Volunteering with Your Partner: How powerful the human-animal bond is and how amazing our animals are. How You Became Interested in AAI Work: My mother has MS and I noticed how much better she felt when Hobbes was around. I wanted to share that with others. Your Partner’s Favorite Place to Visit: Chatfield Reservoir? Swedish Hospital? As in therapy work or just in general? Your Favorite Place to Visit: Washington Park? Swedish Hospital? As in therapy work or just in general? 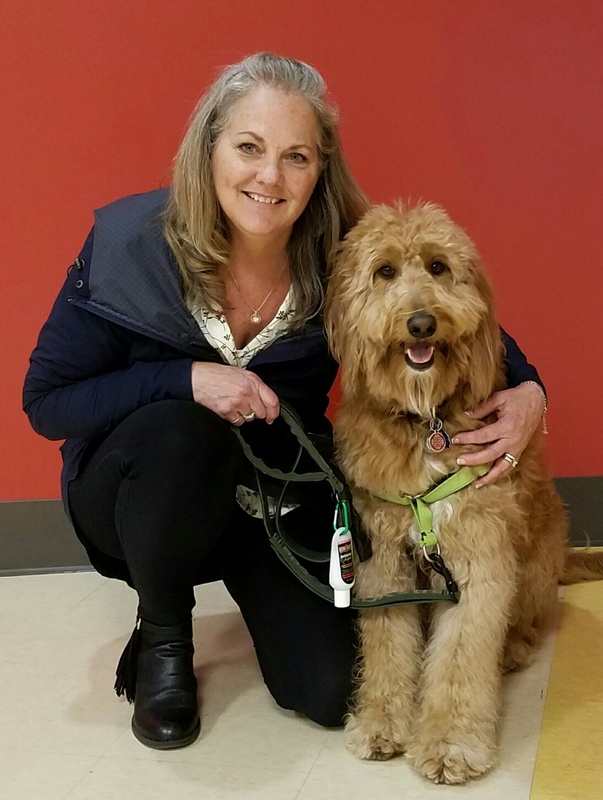 How You Became Interested in AAI Work: When my son was young and was a patient at Children’s Hospital in Ohio, the only thing he remembered from his stay was the dog that came to visit! How Your Partner Unwinds After a Day of Work: A nap on the couch. What You’ve Learned from Volunteering with Your Partner: That no matter how short our visit might be for someone, it impacts them in some way. Anything Else You’d Like Us to Know: Greyson and I have had many visits with patients at The Medical Center of Aurora. One in particular was a gentleman who was recovering from cancer surgery. He instantly bonded with Greyson and thanked us for stopping by to visit. 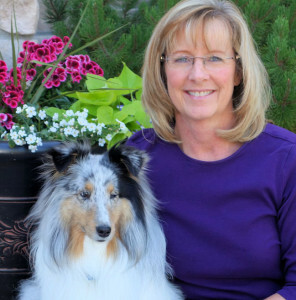 Several weeks after our visit, the Volunteer Coordinator asked if Greyson and I could visit on a particular day, as the wife of a new patient wanted to know if a therapy dog could be with her husband on his first day of chemo. I said, “Yes of course!” Much to all of our surprise it was the gentleman we had met at the hospital. It was a very heartfelt visit and one I will never forget. How You Became Interested in AAI Work: My good friend Jim Harper had BluJeans, a wonderful male golden retriever who was a therapy dog for DPP. I took care of Blu when Betty and Jim went out of town. I absolutely loved Blu and was so devastated when he passed away. When my husband passed away in 2014, I made the decision to get a golden and my goal was to have a therapy dog. Ruby came into my life a year to the day after my husband died. She has fulfilled my dream. Your Partner’s Favorite Place to Visit: Ruby loves every place that we have been: Brookdale Memory Care in Lakewood, Porter Memory Care at Downing and Yale, and various de-stress events that we have had the opportunity to experience. Your Favorite Place to Visit: I love visiting Brookdale Memory Care because I have a friend who is a resident there. How Your Partner Unwinds After a Day of Work: Ruby loves to chew things! If I don’t give her acceptable choices, she will seek out alternatives like pens, pencils and newspapers! What You’ve Learned from Volunteering with Your Partner: It is so wonderful to see the residents and students respond so positively to Ruby and me. Some of the memory care residents have come to remember Ruby, so we try to make our visits as consistent as possible. Anything Else You’d Like Us to Know: On one visit to Brookdale Memory Care in Lakewood, a resident saw Ruby, petted her profusely and then said, “I have something for Ruby – I have been keeping this for her.” The resident went into her room and came out with a colorful ball. Ruby accepted it enthusiastically! How You Became Interested in AAI Work: Long story short…I am a breast cancer survivor and after recovery (a couple years worth) I left my job because my perspective on life had changed. I had had a visit during the first couple days and it made an impact on me. We got Gus as a puppy and I started training immediately with intentions of him being a therapy dog. One of our classes involved going to a senior center and I saw what a difference it can make, even for just that day, in the lives of those who can’t have animal companions with them. 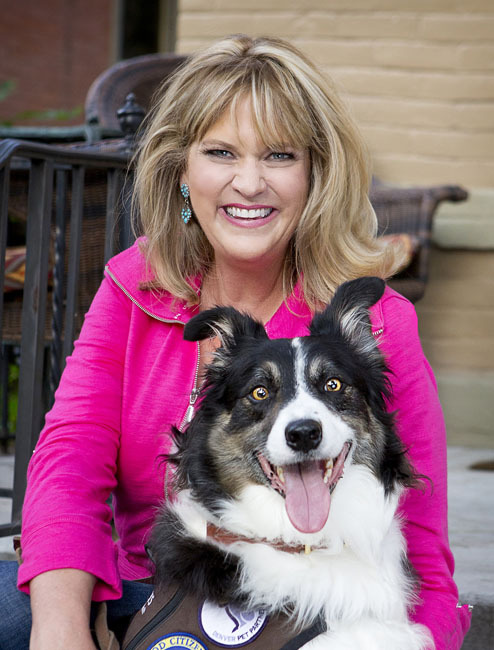 During one of our daily walks I encountered a lady who was training her dog as well and she shared insight to what programs were available and I chose and contacted Pet Partners. Your Partner’s Favorite Place to Visit: I think Gus REALLY enjoys Destress events! That’s pretty much all we do. We visit RVU in that same capacity and love the people there! Your Favorite Place to Visit: I like the outdoor DeStress events better so we can wander…especially if it nice and sunny! Most Memorable Moment: I don’t have any “one” moment yet but the fact that we have many moments of memories…people that are deathly afraid of dogs and yet approach us, tentatively, but overcome their fear…they are so drawn to Gus because of his good-natured vibe. Kids that literally cry because they miss their dog so much that they give Gus a full on bear hug! Bringing that feeling of love and acceptance, which in turn, gives them comfort and positivity during an anxious filled time with tests and deadlines is what it’s all about. Making a difference for just that moment. How Your Partner Unwinds After a Day of Work: He usually gets a snack, then takes a nap. Yep…food then sleep…his favorite things! What You’ve Learned from Volunteering with Your Partner: Initially, I was unsure of how to approach people and pay attention to Gus at the same time…I’ve learned to be proactive for him and hopefully, learned his cues. I’ve become more knowledgeable about how to read peoples reactions to him as well. I want him to be as comfortable as I appear to be but know when he’s not (which I learned at Adventist in Castle Rock) to act upon it. I’ve learned so much about animal interactions/reactions and the connections we make with them. Anything Else You’d Like Us to Know: Since bringing Gus home I’ve found a new purpose in life! He’s brought me AND my husband so much joy and becoming a team for Denver Pet Partners has brought so much more opportunity to give back/share that joy to everyone we encounter. How You Became Interested in AAI Work: I wanted to give back. I thought about Habitat for Humanity and realized I am completely unable to build anything. Then I thought about raising a puppy for a service dog and knew I could not let go of them at 2 years old and finally started researching having a therapy dog. My past two dogs had crossed the rainbow bridge and I began searching for the perfect rescue dog for therapy. I looked at the labs, goldens, german shepherds all the dogs that were typically used for therapy dogs. Finally I went back to a breed that I knew well, the Border Collie and started searching on their rescue sites. 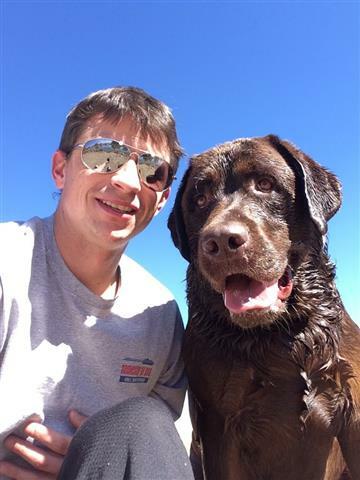 I heard back quickly from one in Wyoming who knew of a 2 year old dog that would work great. The dog was not being fostered and was still with the breeder as she wanted him to go to a good home. Long story short, I got Rhett, a Border Collie ranch dog flunky who turned out to be the perfect therapy dog. Your Partner’s Favorite Place to Visit: Rhett loves kids! So anywhere except hospitals, he is happy. Your Favorite Place to Visit: With my minor in psychology, I wanted to visit at treatment centers for at risk kids. How Your Partner Unwinds After a Day of Work: Rhett has a very low energy level unless there are squirrels around so a good nap is usually his favorite way to unwind. What You’ve Learned from Volunteering with Your Partner: I’ve learned so many things! Probably the most important thing I have learned is from the teenagers that we see at Third Way. Most of the time they come from broken homes where drugs are used, parents are prostitutes and or criminals, their parents are in jail, they have been abused physically and sexually and they have been through the system for most of their lives. I have learned to have compassion for these kids. Now I don’t walk down 16th Street Mall and get annoyed or afraid of the teenage runaways. Instead I realize what they most likely have been through and feel understanding for their recent situation. Anything Else You’d Like Us to Know: My favorite story is of a 6 year old child who had witnessed the death of his brother by choking. The therapists had tried for over 6 months to get him to speak about the accident without success. We were brought in and Rhett performed his magic. The boy would lay on the floor hugging Rhett’s back and telling Rhett that he was safe, that nothing bad would happen to his family and that everything would be ok. He told us what happened after 3 sessions with Rhett. 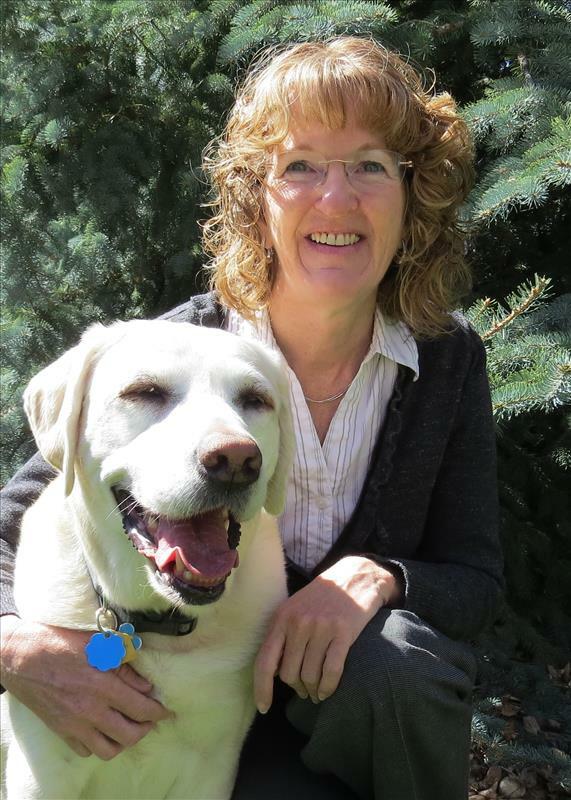 How You Became Interested in AAI Work: While visiting my beautiful Aunt Roberta, I noticed residents talking about their beloved pets and how much they missed them. I started bringing Kuzco when he was only 6 months old to visit my aunt and her friends. Our visits grew to visiting family friends in 3 locations. After the passing of our family and friends within 3 months of each other, we stopped visiting. I noticed Kuzco missed people, especially the elderly. It was then I decided to start the DPP registration process with Kuzco. Your Favorite Place to Visit: Elk Run Assisted Living. How Your Partner Unwinds After a Day of Work: With energy to spare, Kuzco likes to play and nap on a sunny deck. What You’ve Learned from Volunteering with Your Partner: Kuzco knows who needs his visits and extra attention. I am getting over my embarrassment of Kuzco peeking into rooms before I can knock and introduce us. 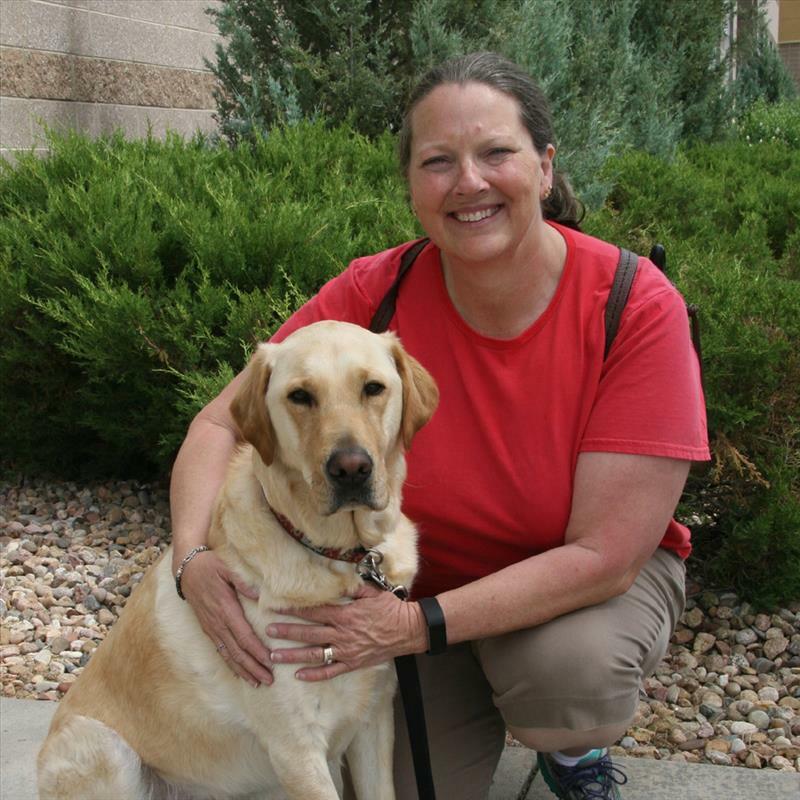 How You Became Interested in AAI Work: Bronx was previously a service dog with Guide Dogs for the Blind, but was early retired when he was 2 ½ years old. When I early retired from work in 2016, I was doing some volunteer work that wasn’t tugging at my heart. That is when I decided that doing volunteer work along with Bronx would be much more rewarding and would use his previous skills learned from being a guide dog. Your Partner’s Favorite Place to Visit: Bronx loves the visits with Night Lights. He gets to be loved on by young kids with all kinds of challenges. He is totally spoiled on those nights! And he just loves all the kids! Your Favorite Place to Visit: I enjoy going to Parker Adventist Hospital where we are able to visit with patients and their family and friends. Also the staff members at the hospital just get a kick out of seeing Bronx during their work day. It is so fun seeing all the smiles that Bronx brings to folks faces. How Your Partner Unwinds After a Day of Work: He takes as extra-long nap! 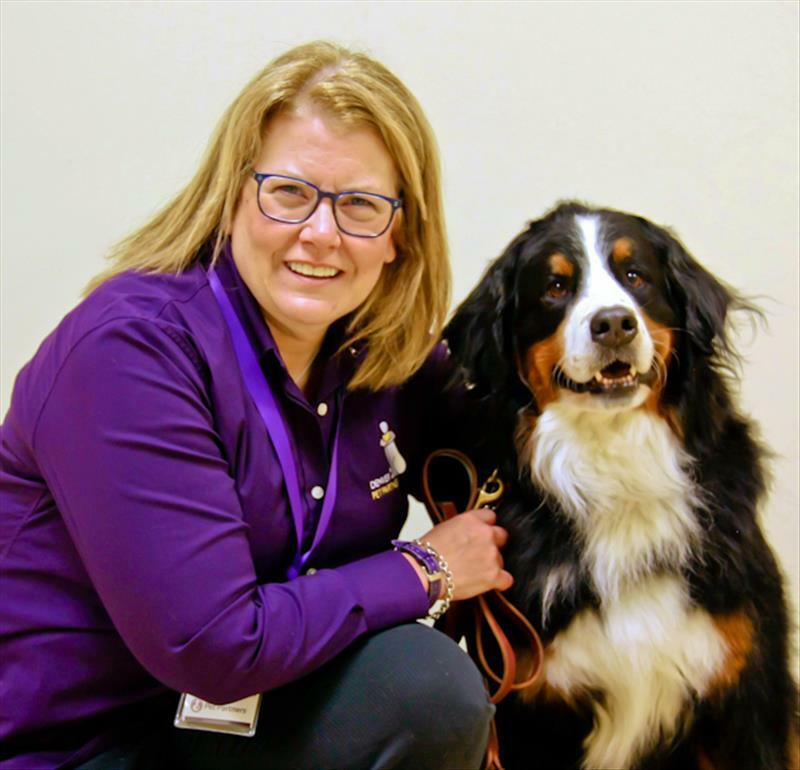 What You’ve Learned from Volunteering with Your Partner: Dogs really do make a difference not only in our lives but also in the lives of all the patients, children and people we get to visit with. Anything Else You’d Like Us to Know:There is one visit with a patient at Parker Adventist Hospital that is so memorable and rewarding for me. We were visiting with a patient and she had several of her family members in the room at the time. She totally lite up with a big smile and big laughter when she saw Bronx and started petting him. She laughed and smiled the entire time we were in the room with her. Her family told me that was the first time she had smiled in several days. I almost started crying at the thought that Bronx brought her that much joy in a time of obvious need.